Zebra 5095 series resin thermal transfer ribbons for Zebra industrial printers including Zebra S4M, Zebra ZT220 (maximum length of 300m), Zebra ZT230, Zebra ZM400 and ZM600, Zebra 105SL and Zebra 105SLPlus, Zebra 110Xi4, Zebra 140Xi4, Zebra 170Xi4 and Zebra 220Xi4. 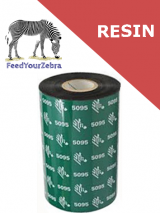 Our Zebra 5095 high herformance hesin ribbon produces images resistant to most harsh environments: smearing, moisture, abrasion, extreme temperature and chemicals, when printed on Zebra’s synthetic label and tag materials. The low energy requirements for this ribbon will allow for excellent print quality, even when very small fonts are required, and high print speeds are possible.